With the academic year coming up, quick videos that capture the imagination of learners and at the same time give a quick impression of relevant topics are in high demand. Graham Attwell and Andryan Puscuta have published a great video on Personal Learning Environments. It hits the mark with quickly talking about history of recent communication, informal <=> formal learning and what PLE's are. A surplus of this video is the comic book feel it is designed in. If you are interested in implementing this type of design, there is a great photoshop tutorial on how to get this look on to your pictures (and with some experience in other software's you can extrapolate it to free or other designer software). Graham Attwell has an eLearning blog Pontydysgu with lots of links to other audio and video material. The great thing about Graham is that he shares what he learns, it is really great material. And here is the movie I mentioned. It is really handy as an PLE intro, or at least I think so. Thanks to the great College20 community started by Eduardo Peirano, I could read a post by Alejandra Pickett that really blew my mind. The way she build her course is a great example of combining several relevant Social media to enhance a course. If you are a member of the College20 community, feel free to immediately surf to her post. (btw the membership is free and the community runs on ning.com software). As a way to support her learners, she used Jing, which I covered in a previous post, extensively. "Here is a tour of my course in which i use several web tools external to the moodle, the course management system. http://groups.diigo.com/groups/ETAP687 - shared references and resources that persist beyond the end of the term for student access. http://etap687.edublogs.org - instructor and student metacognitive journaling activities and descriptive feedback. 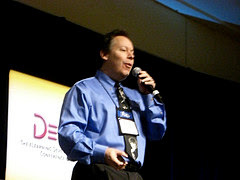 http://tinyurl.com/5vd8hc - podcasted interviews with online exemplar courses and faculty." Not only that, but it seems that Alejandra Pickett's expertise lies in Second Life, just stroll around her slideshare shows. Impressive! The eLearning Guild Research 360° Report on Measuring Learning Success is just out. As usual the research reports of the eLearning Guild are interesting to read. They give a quick overview of some of the latest trends and results in eLearning. But what makes this research so interesting is that both Steve Wexler and Will Thalheimer will have a webinar on the findings in this report. This might be a rich extra, because it gives you the possibility of getting your questions out to them. 'Might be' I write because I am not sure if there will be a lot of time to discuss, but at least you will hear it from the report writers themselves. 2) Are you able to show that your learning interventions benefit your organization? You can look at the abstract of this report or - if you are a payed member, you can download it completely at the same page. Hosts and speakers: Steve Wexler and Will Thalheimer. This webinar is free but you need to register. It's a case of the optimist versus the pessimist view on life. During the latest Intel Developer Forum in San Francisco, California, one of the topics in the visionary keynote was wireless power. Justine Rattner, Intel's vice president, demonstrated a Wireless Resonant Energy Link (WREL) to power a 60-watt light bulb without the use of a plug or wire of any kind, which is more than is needed for a typical laptop. For this technology Intel said they were using principles developed by MIT scientists developed by MIT scientists. "WREL technology employs strongly coupled resonators, a principle similar to the way a trained singer can shatter a glass using her voice, Intel said. At the receiving resonator's natural frequency, energy is absorbed efficiently, just as a glass absorbs acoustic energy at its natural frequency. With this technology enabled in a laptop, for example, batteries could be recharged when the laptop gets within several feet of the transmit resonator, the company explained." as the TG-daily reported. But than again the pessimist in me is quick enough to get me focused on possible dangers that need to be taken into account. What about the radiation of these wireless power solutions? 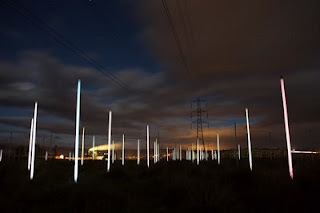 I remember the great works of art Richard Box set-up using nothing more than stand-alone, non-connected light tubes, spread underneath high voltage transmission towers. The effect was amazing light without needing to connect the lights to an electricity plug (see the photo: 'shake pole by Richard Box). It is clear some radiation is filling the air surrounding these high voltage towers. And while reading the article something else came to mind: is the radiation that is used in this future wireless power supply using the same frequency as microwaves and cell-phone radiation? If anybody knows this, feel free to fill me in. Because if this is indeed the case, those radiated microwaves could effect human health. I know a lot of people put question marks on the research that is focusing on microwaves from cell-phones and the possible effects they can have on health, but I always try to be safe. If simple measures (hands free set, radiation free isolated homes...) can make sure I do not have to worry about whether these waves do have an effect, I simply apply these safe guidelines. If you are interested in reading up on radiation from cell-phones and human health, feel free to have a look in the publication list of the computer science researcher Mikko Ahonen from the University of Tampere, Finland. Mikko Ahonen also has a great blog on open innovation, creativity and technology. Why are the optimist and the pessimist seldomly agreeing on the same thing? And thanks to great colleague Carlos Kiyan for getting me on to Intel's wireless power vision. Do you remember the time that you were trying to cope with geometry? I remember my encounter with squares and formulas and well, I was not to enthusiastic about it. But now there is geometry fun coming right to your screen! Emre Sevinc (who has an astonishing knowledge on eLearning, IT architecture and cognitive sciences amongst others) got me on this great movie which features geometrical characters that speak with the voices from famous actors. "Flatland: The Movie is an animated film inspired by Edwin A. Abbott's classic novel, Flatland. Set in a world of only two dimensions inhabited by sentient geometrical shapes, the story follows Arthur Square and his ever-curious granddaughter Hex. When a mysterious visitor arrives from Spaceland, Arthur and Hex must come to terms with the truth of the third dimension, risking dire consequences from the evil Circles that have ruled Flatland for a thousand years." Does not this look like great fun! And look at the trailor, its simply motivating. And the movie is part of an educational dvd also. Sometimes I wish I was a kid in this age. Another movie that made my day yesterday (watched it on my mobile while commuting) is 'the history of computers' made in the 20th century, it still gave me great new insights in the computer evolution (new names, economic factors). I just love these new media. Okay so the group is always right and knowledge should be free for all. BUT what if the content you want to deliver for free through TELearning (technology enabled learning) kind of site is so specialized that only a couple of people know about the latest scientific developments? You could not put it onto a freely editable wikipedia? Or could you? Lets look at the Illustrated Lecture on Tropical Medicine that is published on a website by ITM. It would look like interesting content to share in wikipedia, the only problem is that Tropical Medicine is discussed by many for many reasons (think about the imagined solutions for AIDS that are promoted by some African politicians for dubious reasons). So at ITM we are discussing whether or not content that is so specialised can be shared with an editor’s community like wikipedia. At this point the verdict is still no, but we do put the content out there for people to see because we feel it could help physicians in the field with extra diagnostic material. Would you deliver highly specialized content in an open environment where others could change it and risk the scientific data being disrupted or being pointed in another direction? A bit of background on the Tropical Medicine content: at ITM we have a lot of renowned professors in Tropical Medicine and one of the really amazing ones is Dr Erwin Van den Enden who is renowned for his insightful diagnosis and knowledge. The knowledge in Tropical Diseases is really specific and its research is constantly changing so a book would soon be redundant. At ITM Dr Erwin Van den Enden and San-Ho Correwyn have been working on a website that features an encyclopedia on Tropical Diseases which can be updated by them daily if necessary. This encyclopedia was build with content-e (a Dutch software) that enables single source manipulation (changes only have to be made in one location, like a wiki, but it does not keep an online history of the changes made). The content is updated as soon as new research has conclusive evidence to change earlier findings. It is a huge job that has helped health workers throughout the globe, so that is worthwhile on its own. Social media’s content demand is driving me nuts! (Well ok, it is my drive that drives me mad). Although I have been limiting my content output (mainly blog) I still have a drowning feeling. I limit my feedreading to two times a week and even that demands more time than I would wish it to take. But as a knowledge worker I have the feeling that I must learn, read, write, share and learn again. Due to the content overload I have a tendency to read diagonally, but this speeds up my brain and in all honesty I am no rain man; if I do not read something carefully or I do not reread after a set amount of time, I just forget it. I started of as a member of the MTV generation and I am quickly growing into the SoMe-generation (= Social Media generation). This is affecting me more than I could have imagined at the beginning of my increased social media presence. Because although I have felt a great push forward in my knowledge at the same time I am increasingly aware of the shortened attention span. And however short I make it, it will never allow me to keep on top of all the content that is out there. The Greeks new it Panta Rei, but it starts to flow a bit too much for my brain. Alexander Van Elsas talks about the unlimited power off social media that is bound by human limitations. Rob May who wrote an ironic article about it a year ago (What a year ago? That’s old man!) and he makes a very valuable remark on the benefit of long term growth. Hutch Carpenter with a few nice pointers. The image: I want to keep an open mind for enlightening signals of information, but at the same time keep the overload of superfluous information out… that is not easy. 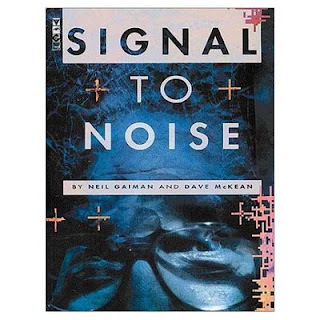 There is a comic strip that I really love: ‘Signal to Noise’ by Neil Gaiman and Dave McKein. I did not fully get it a couple of years ago, but everytime I read it it grows on me. Through the last decade some myths got their paws on eLearning. And although a lot of us try to get these myths banned, they keep popping-up whenever I have an introduction talk on eLearning. Because these myths keep on roaring their ugly heads, I have written down my top 5 list of agonising eLearning myths to use them in a small booklet I am working on. I also added my short reply to these mythical questions. I bet you know (some of) these myths and I am especially interested in your replies. Please feel free to make your own list and send me your blogpost so we can share expertise (or laughs). No way, eLearning is all about engaging humans and using technology as an instrument to help people learn. It is a misconception that an eLearner has no social contact with other e-course members. Well-constructed eLearning is about human interaction (discussions, group work...) and monitored and/or guided by tutors, subject matter experts and peer learners. eLearning is all about Learning and human interactions. 2. Everyone knows what eLearning is! Not at all! Everyone has her or his own definition, even between eLearning professionals there are discussions on what eLearning is or should be. Before starting an eLearning project it is essential that you discuss with all the stakeholders of what there definition of eLearning is and how they see the project being developed. Would not that be nice! Unfortunately eLearning costs. It demands a financial investment in hard- and software (the latest can be kept to a minimum), infrastructure and last but not least in teachers, tutors, developers. In a lot of cases corporations and institutions ask for ROI (return on investment) but what you definitely also need to consider is return on human investment. 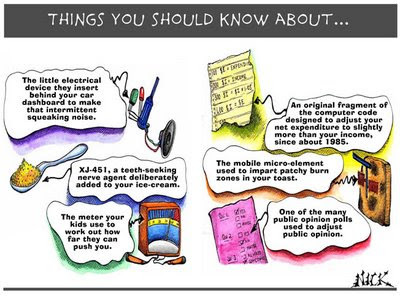 eLearning costs, but it has definite learning and human benefits. Luckily eLearning takes time. If you want learners to learn content, you would want to invest a lot of time thinking about content, learning objectives, pedagogical methods and all around interactivity. eLearning takes time because it is about teaching people new skills and getting them to rearrange the knowledge they have with updates, new ideas and so on. 5. eLearning is putting text online and adding multiple choice questions! Argh! There is no course on earth that will have great learning outcomes if this is the only thing you provide to your learners, so why would this approach work for eLearning? eLearning is about interactivity, addressing different learner skills, challenging learners and making them take initiatives... keep your learners active and do not mock them by delivering them boring old-school mash. Today I am building on previous posts on personal marketing and how to write papers in order to motivate myself to write more and enhance my chances on being published. 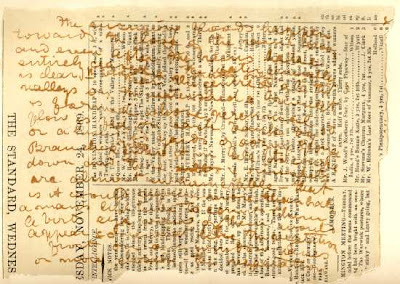 Yes, I believe in the power of the written word. If you want to submit the paper at Actapress, you can do it here (if the server does not run out). so look around and see what could be useful to you.After reading the great list of Christine Olgren, I have nothing more to add… unless you know about extra journals or magazines to be published in? How can you get relevant survey data from your learners' mobile to your server so you can immediately build on new knowledge? Indeed, by using mobile survey software that allows a variety of data exchange. Mobile surveys that send back usable data is a quest on its own. Yesterday and today I was testing out SurveyToGo a mobile survey software build be Dooblo. At ITM we want to start with data surveys that (ideally) will cut down our field time and give farmers, physicians or researchers in the field a more autonomic way of giving data feedback to us and our South partners. Taken mobile surveys is a way we are exploring today. What we look for is survey software that will enable us to give free text, answer multiple choice and even - if possible - let the person in the field take a picture of a certain region, cattle or other species or skin rash etcetera depending on the type of data we are looking for. This is no small thing! It demands an awful lot from the developers side and with SurveyToGo I think we might have a breakthrough (thanks to designer extra-ordinair San-Ho Correwyn) for directing me to this wonderful mobile software. If you do not want to read the post, but immediately want to start reading SurveyToGo documentation, lookie here; or jump into the basic demo. Before starting: this is mobile software for Windows Mobile phones. The installation is not up and go, you need to read the instructions carefully. But then again this software is really sophisticated (you can even keep track of quota if necessary). The fact that it is such sophisticated software makes it very useful in research areas because the survey developer has a certain amount of autonomy that enables her or him to design the survey up to the real research or educational needs. I have chosen to install the software on my desktop first and then (using my MS activesync) getting the first survey onto my mobile by synchronisation. This did take more steps then Dooblo mentions in their pdf helpfiles. This was mainly due to the fact that I needed to manually install (= double click) on the mySQL and an update setup on my mobile... so not that difficult if you are used to looking at such solutions. The window for the installation to the mobile did block so I had to hard stop this window. The first survey I had installed on my mobile device (HTC TYTN) swiftly went through the first test survey. That was a relief. Now all the necessary software was installed on my mobile device, I decided on building a second survey. To get this latest survey onto my mobile device, I just needed to synchronise my mobile device through the web, this got the latest survey on my mobile. So you only need to install the software once and after that it goes out to look for the latest surveys. It really works like a charm. Exporting data could be done by a range of preferences (possibilities: Excel, Access, Word, spss, XML provider or SurveyToGo itself) and this was also remarkably easy. I did not read up on this, I just tried it out and it worked rather intuitively. The software lets the developer add rules (making it possible to skip the the next relevant question), put in recognizable characters for the variables of the questions (nice if you quickly want to analyse the results of the survey or if you like this to connect to your research). You can add 'advanced question options' that allow you to add a 'no answer' or 'other' option to any question. In short after only two days of testing it is clear that SurveyToGo mobile survey software has an amazing potential. If all goes well and one of ITM's top veterinary researchers Maxime Madder gives his okay, we will be test driving this in South-Africa within months. Once we launch into it, I will keep you informed. By then we will have tested different cell phones and toyed with users and survey deployers to get a better idea of what is possible or not. The thing I still need to figure out is the final message, which would give the users a nice feeling after finishing the survey. I guess I can make it as another question that will not be taken up while the survey data is exported. Really this is great software AND there is a great free full trial, so try it out. This mobile software really made my day because it solved a research need. Jane Hart from the Center for Learning & Performance Technologies is still looking for Top 10 Tools for Learning. Anyone who wants to add their knowledge feel free to go to http://www.c4lpt.co.uk/recommended/yours.html and add your own list. Opera mini browser http://www.operamini.com/ : this browser saves me on download time and size (which comes down to saving money). Find.mobi http://find.mobi/ mobile search engine delight, but unfortunately only in English for the moment. QIK http://qik.com/ real live streaming right from your mobile. Great for immediate sharing of knowledge or teaching on the go. Quickmark http://www.quickmark.com.tw/En/basic/index.asp is a really cool QRcode reader that can easily be installed and catches QRcodes quickly and efficiently. Flickr mobile http://m.flickr.com/ for my mobile on the go shots. YouTube mobile http://m.youtube.com/ for really easy uploading of mobile videos. Mobile active http://mobileactive.org/ keeps me informed on great mobile projects throughout the world. Fring (VOIP) http://www.fring.com/ which keeps me connected to other mobile colleagues and friends. Looking forward to the Fring mini, which promises to be a solution for global cell phones that are not VOIP enabled. Mobile study questionnaires http://www.mobilestudy.org/home/ a really easy and free way to give your learners access to mobile multiple choice quizzes. Let me know any great mobile tools you are using, always hungry to learn! Back on my blogposting track after a marvelous holiday in Canada and a bit of relaxation in and around Belgium. Before I went on holiday I started thinking about my identity (personal marketing and identity open and everywhere). My virtual friend emapey (who just did a great job on redesigning his Online Sapiens blog) pointed a finger at a small inefficiency on my blog: my profile. My profile was nothing more then a couple of words without too much meaning. Although my longterm virtual colleagues might know who I am, a clear profile is necessary for any short time visitors. I also noticed that my resume was completely out of date, reflecting the speed with which eLearning is changing and growing. This fall I will follow some modules from the master course on distance education at the Athabasca University, so I was in need of an updated resume as well. But what a job this is! I had forgotten projects, misplaced abstracts... my mind forgot things I did... it was hard work to get the puzzle back together again and mold it into something useful. The result still is not as thrilling as I would love to see it, but at least it gives a clear idea on the things I have been working on recently. So thanks emapey for kicking me in the behind and push me to update my profile. Suggestions welcomed. Happy to be active again in the virtual realm.